Fructose, purified water, vegetable-souirce glycerin, naturla raspberry flavor, citric acid. For Daily Maintenance: Children 1-6 Years of Age: Take 1 teaspoon (5 mL) daily. Children 7-12 Years of Age: Take 2 teaspoons (10 mL) daily. For Intensive Use: Children 1-6 Years of Age: Take 1-2 teaspoons (5-10 mL) twice daily. Children 7-12 Years of Age: Take 2-3 teaspoons (10-15 mL) twice daily. For Daily Maintenance: Children 1-6 Years of Age: Take 1 teaspoon (5 mL) daily. Children 7-12 Years of Age: Take 2 teaspoons (10 mL) daily. For Intensive Use: Children 1-6 Years of Age: Take 1 to 3 teaspoons (5-10 mL) twice daily. Children 7-12 Years of Age: Take 2 to 3 teaspoons (10-15 mL) twice daily. Children 1-6years of Age: Take 1 to 2 teaspoons (5-10mL) twice daily. Children: Take 2 to 3 teaspoons (10-15 mL) twice daily. Children 1-6 Years of Age: Take 1 teaspoon (5 mL)daily.Children 7-12 Years of Age: Take 2 teaspoons (10mL) daily. For Daily Maintenance:Children 1-6 Years of Age: Take 1 teaspoon (5 mL) daily.Children 7-12 Years of Age: Take 2 teaspoons (10 mL) daily. For Intensive Use:Children 1-6 Years of Age: Take 1-2 teaspoons (5-10 mL) twice daily.Children 7-12 Years of Age: Take 2-3 teaspoons (10-15 mL) twice daily. 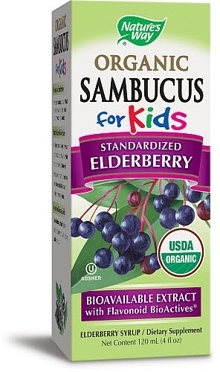 The high potency of BioActives constituents in Natures Way Sambucus standardized black elderberry extract are proven to be bioavailable and active within the body for optimal effectiveness. Fructose, Purified Water, Vegetable-source glycerin, natural raspberry flavor, Citric acid.